Attention wine lovers! We have something that might pique your interest. New England has so much to offer when it comes to high-quality products, and whether you love wine or simply enjoy a glass every once in a while, you are going to love the wineries near Mystic, CT! Nested in beautiful settings, the vineyards we have selected for you are the perfect day trip activity for you and your better half. Not only will you get to discover stunning landscapes, you’ll also taste delicious regional wines. 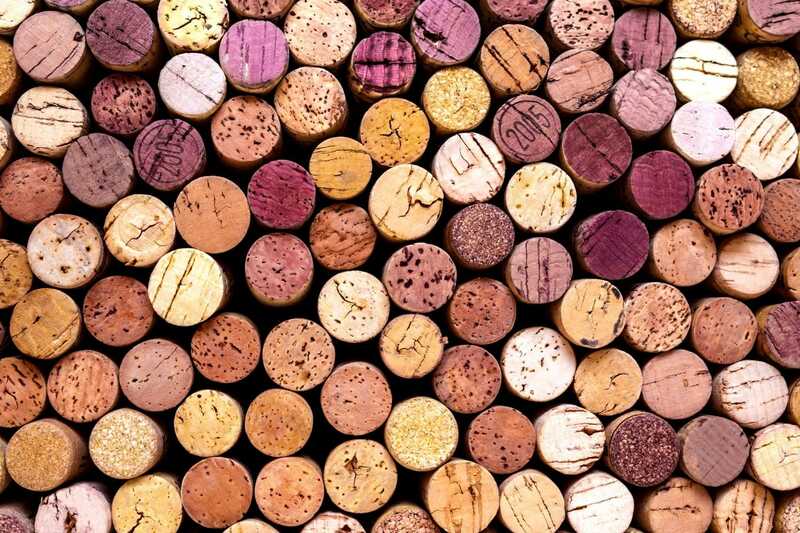 Start planning your trip today and visit the top wineries near Mystic, CT. If you enjoy touring these wineries near Mystic, CT, you will love all the other activities we have gathered for you! Download our free Vacation Guide and get our recommendations for gourmet restaurants, outdoor adventures, fascinating museums, lovely cruises, quaint shops, and more! Jonathan Edwards Winery is where “New England charm meets Napa style”. It is one of the most beautiful and picturesque wineries in the region. This 48-acre property planted on top of a hill has been enchanting locals and tourists for almost two decades. The tasting room is open daily from 11 a.m to 5 p.m and offers complimentary tours every 30 minutes. To accompany your drink, a selection of local cheeses and snacks is available at the bar! It is impossible to visit the best wineries near Mystic, CT, without stopping at Stonington Vineyards. This prestigious 58-acre property was established back in 1987 and is one of the founding members of the Connecticut Wine Trail. Stonington offers top-notch wine tastings all year long from 11 a.m to 4:30 p.m, and you can even bring your own food for a savory picnic! Maugle Sierra Vineyards is located north of Mystic and gives tourists the opportunity to visit no matter the season. It’s a fantastic place for a fun and delicious happy hour! Bring your loved ones and taste some of the best cuvees in the golden light of sunset. The winery offers tasting classes five days a week from noon to 6 p.m for a minimal cost ($12 per person). Enjoy some live music on Friday evenings and Sunday afternoons! Saltwater Farm Vineyards is a stunning 100-acre property located along the Connecticut coast. Here, visitors can soak up incredible views while sipping a tasty Sauvignon Blanc on the terrace. The unique atmosphere mixes New England traditions with a contemporary approach, and the tasting room is located in a modern restored hangar from World War II. Try some of Saltwater’s best wines along with some local cheeses and spend a perfect afternoon in the countryside. 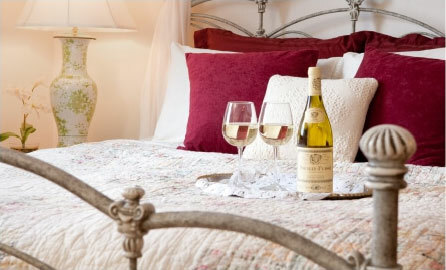 After spending the day hopping from winery to winery, come home and rest in a comfortable room at Stonecroft Country Inn. Our stunning accommodations are the perfect love nest for you and your significant other. Relax in an authentic New England setting and let us take care of you! Book our Briar Rose Suite and dive into its romantic atmosphere after all your adventures. You will feel at peace after a hot bath in the Jacuzzi tub! 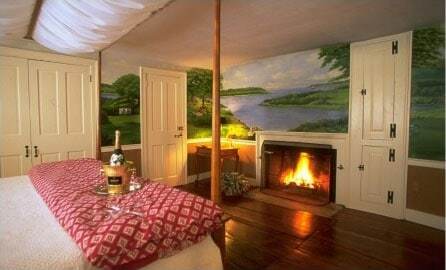 Cozy up by the fireplace and get a good night’s sleep in the gorgeous four-poster queen bed. Wake up the next morning to the sound of birds chirping and join us in the main house for a delicious homemade breakfast. We highly recommend you try our fluffy French toast; it will keep you energized all day long! Enhance your stay with a special Romance package! This includes a dinner for two at Capt. Daniel Packer Inne, a dozen red roses, a complimentary bottle of prosecco, and chocolate-covered strawberries.